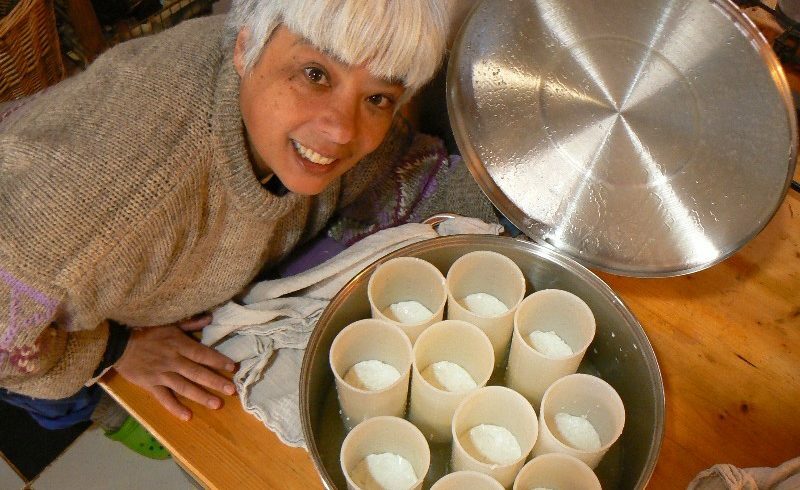 This is my Fresh Cheese Recipe. Before I made this cheese I had never made cheese in my life. 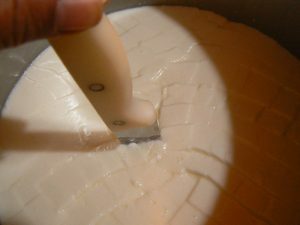 So do not worry this cheese making recipe is easy. You need a view things like renet, which you might have to buy in a special shop. The rest you will probably have in your kitchen. I do not have much official cheese making stuff. I use mainly normal pots and pans from the kitchen. Here is my list with things you will need. 1l jars or bottles to keep the milk in the fridge. I milk my own goats and use their milk to make my cheese. Fresh non-homogenised, pasteurised or raw milk is best to use. 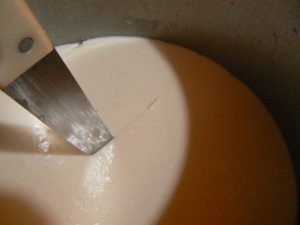 Sterilised milk does not work and when you use homogenised milk you have to add Calcium Chloride; 1ml per gallon ( 3.785 l), otherwise the curd will be too soft to make cheese. 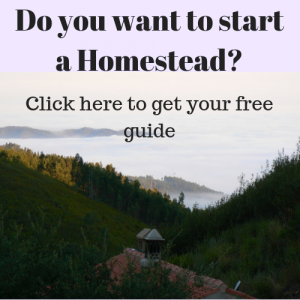 You can use goats, sheep or cows milk. If you get your milk fresh from a farm make sure you store it in a sterilized container. Cooking pot that can contain at least 3 liters of milk, best is stainless steel. Thermometer that reads up to 31C. A container with holes. I use an official cheese mold now. Before I used to have yogurt container in which I made holes with a hot iron nail. You will need 4 or 5. 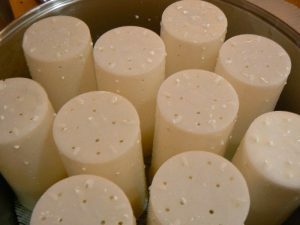 To let the cheese drain I use a big pot with one of those grids that you use to cool down a cake on, in it. On top of the grid I put a cheese net. Anything with a fine netted structure that is for preparing food will do. Ferment. You can buy this on the internet, I use cheese ferment that is used for Gouda cheese. You can also buy buttermilk and use that instead. Rennet. In Portugal you can buy it at the farmacy. It is an artificial one, I prefer the real, natural one. I buy it on line at a Dutch online store. 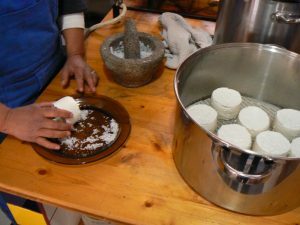 If you just want to try the cheese making and do not know if it’s really your thing the stuff from the farmacy will do. I sterilize all my tools first. It is very important to work clean. 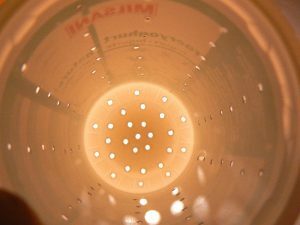 I use boiling hot water to sterilize. some people use a Chlorine solution, but I so not like it because I think you can taste the chlorine in the end product. 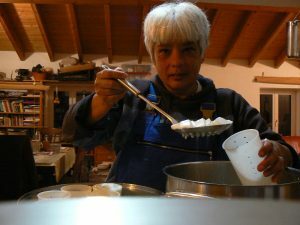 I use three liters of milk, which I poor in the stainless steel pot. If you use bottled milk from the supermarket you have to add the Calcium Chloride now. Heat up the milk until 21C while stirring. Turn off the flame and add 1 tablespoons of ferment or 4 tablespoons of buttermilk. Leave it for 30 minutes. After that I heat up the milk until 31C. I then take the pot from the fire and add the rennet. I use liquid rennet. 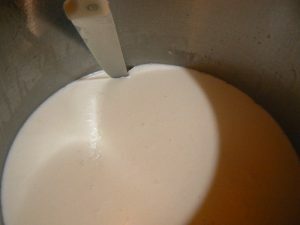 So I stir the milk until it is spinning around in the pot, then I drip in 7 drops of rennet and spinn the milk abit more. Then I stop the movement of the milk by counter stirring it with some force. The liquid needs to be still after this exercise. Now I leave it for an hour. Then I open the pot and with my knife check if the curd is hard enough. If not it needs to sit longer. 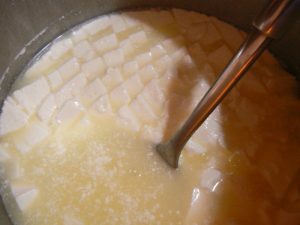 I do this by pulling the curd of the side of the pot, when it comes lose I know it is ready. Now I can cut the curd in 2cm squares. And I leave it for half an hour. 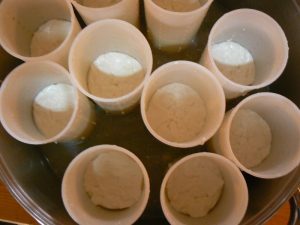 Then I take the skimmer and scoop the cut curd in the cheese containers with the holes. Then the forms are placed in the big pot and let them sit there overnight. I put the lid on the pot and leave it slightly open so the cheese gets some air. I cover the opening with a cloth so flies can not spoil the cheese. The next morning, after 12 hours. I turn the mold upside down. Do not take the molds of yet! 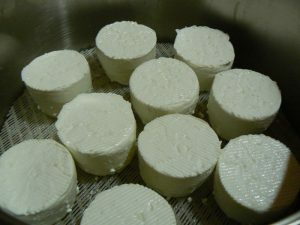 The evening after that I take the molds of and turn the cheese once more and leave them another 12 hour. Them I roll them in salt and I am done. Turned forms, leave them on for 12 ours. In case there is a problem with the cheese making please leave a comment and notify me. I will help you until it works. I very much appreciate your feedback.